A couple of months ago, the very existence of this rather lightly traveled blog helped me reconnect with a friend from our hometown. Bill was a year ahead of me at our high school in central Wisconsin in the mid-’70s. We didn’t know each other well, but I knew through mutual friends that he was a fairly cool guy. Long story short, Bill came across The Midnight Tracker on the web and got in touch. Back then, “The Midnight Tracker” was a late-night program on our local FM radio station, the one that was Top 40 by day and free-form by night. We both listened to it. Bill has a special fondness for the program, but we’ll share that story another time. I asked Bill whether he had any requests for The Midnight Tracker. He responded with a rather formidable list of early ’70s rock albums. Tonight’s selection on The Midnight Tracker, materializing through the sweet blue haze of time, is one. 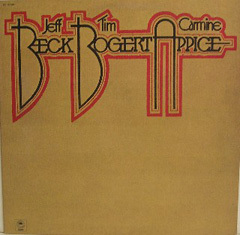 “Sweet Sweet Surrender,” “Why Should I Care,” “Lose Myself With You,” “Living Alone” and “I’m So Proud,” Beck, Bogert & Appice, from “Beck Bogert & Appice,” 1973. This is Side 2. It runs 18:51. It’s out of print but is available digitally. Rock, soul and blues come together on this side from the early ’70s supergroup. It’s mellow at the start, then gets all crunchy and raved up (the third and fourth cuts are originals), then wraps up with a mellow Curtis Mayfield cover. 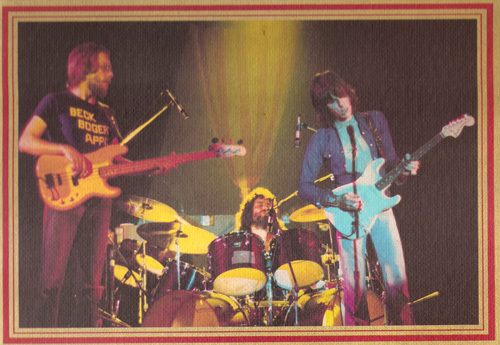 British guitar great Jeff Beck had long wanted to work with bass player Tim Bogert and drummer Carmine Appice, a couple of New Yorkers who had been in Vanilla Fudge and then Cactus. He started noodling with the idea of forming a power trio as early as 1969, but it didn’t happen until three years later. The career arc of Beck, Bogert & Appice is a bit like a shooting star, burning brightly for a short time but fading quickly. They started playing live gigs in the fall of 1972. They recorded their first (and ultimately only) studio album that winter and released it in the early spring of 1973. They kept touring for much of 1973 and released a live album that fall. They finished the tour in January 1974 and started recording a second studio album. They split up before summer arrived. Three guys, one group, two years, two albums. The second studio album never saw the light of day, save for one cut that appeared on “Beckology,” a 1991 retrospective of Beck’s career. It happened so quickly that I never had a proper introduction to them. Bill has remedied that, almost 40 years later.